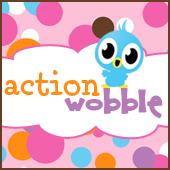 For this week's project inspiration, I'm sharing some of my favorite Action Wobble projects! Jack in the Box Card - Click HERE for the original post. Lovebug Cricut Frame - Click HERE for the original post. *Pumpkin Easel Card - Click HERE for the original post. We hope you liked the projects! Now it's your turn!